873 Movement Light Squadron, R.E. You may need to 'refresh' this page to see the latest version. 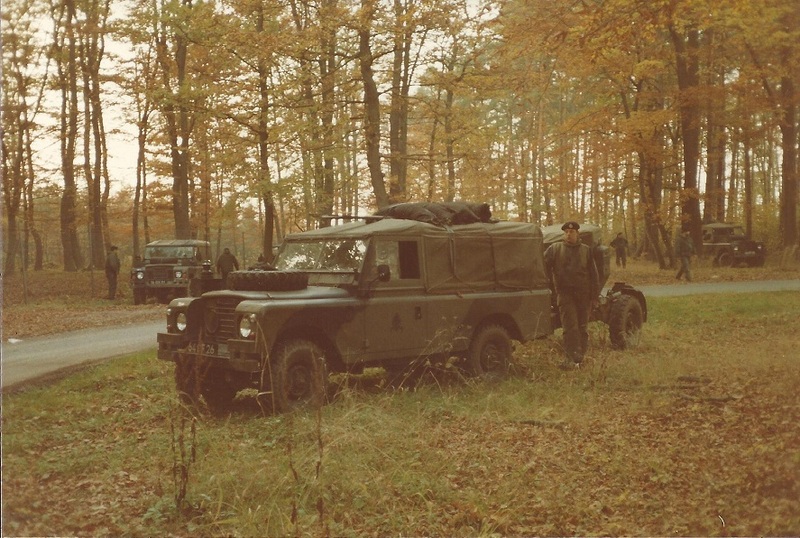 Photo courtesy of Bob Richardson (ex-873, 1969-70 and 1973-75); Names provided by Bob Richardson, Ed Woodroffe, Peter Cox & others. Numbers are above or left of heads (an improved numbered version will be posted shortly). Click photo for a good un-numbered version. 57 in all. 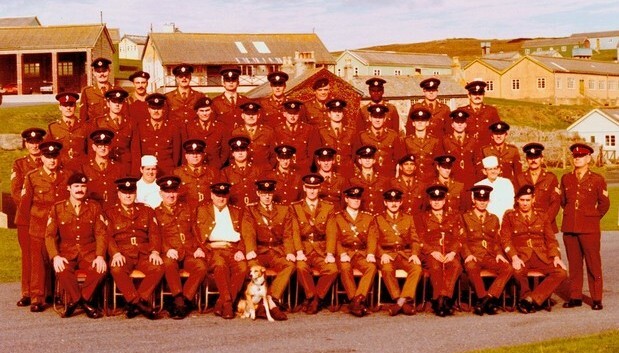 6 offs, 13 SNCOs (incl PSI), 38 ORs incl 4 cooks but no Janicki. Note: 3 WOs in front row. Also note 2 unmounted lights. 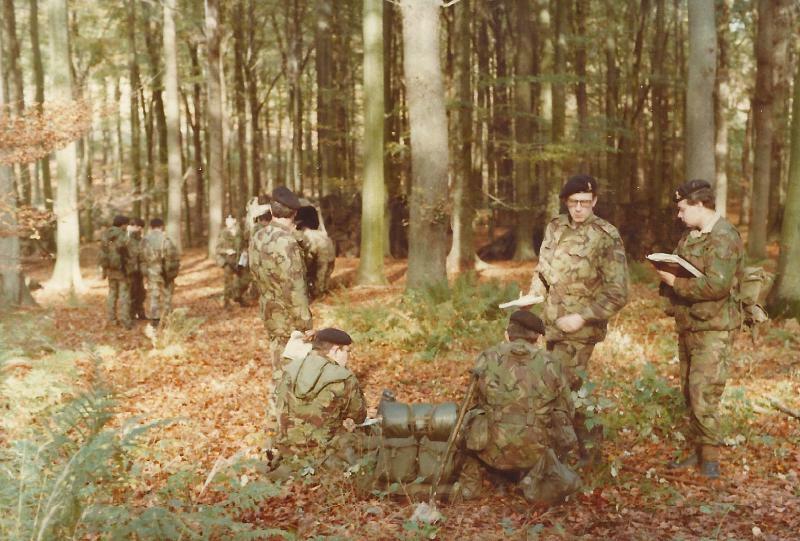 Steve West (no 6 above) says this was at Fingeringhoe; previously this was listed as being at Thetford. S/Sgt Miles ? in No. 2s striding away from demounted 90cm. 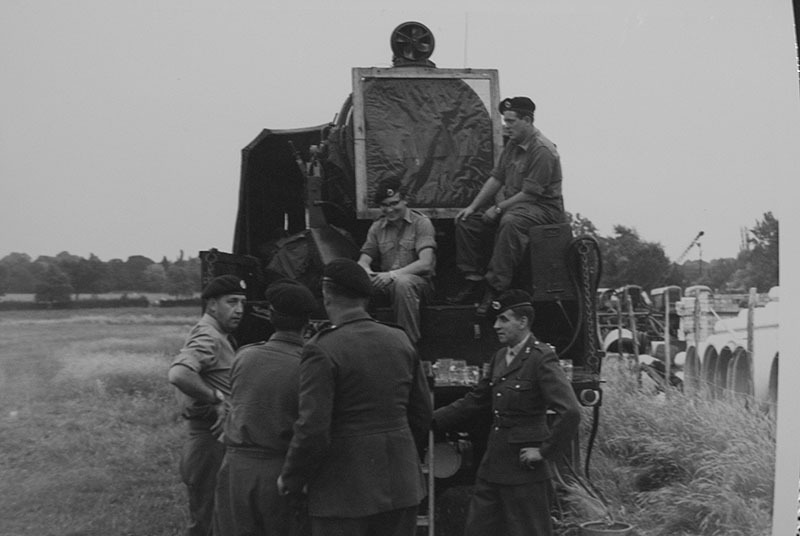 The photos here were taken by S/Sgt Jack Woodroffe (later WO2/SSM) and kindly provided by Jack's son Ed. Both thought about 1967. 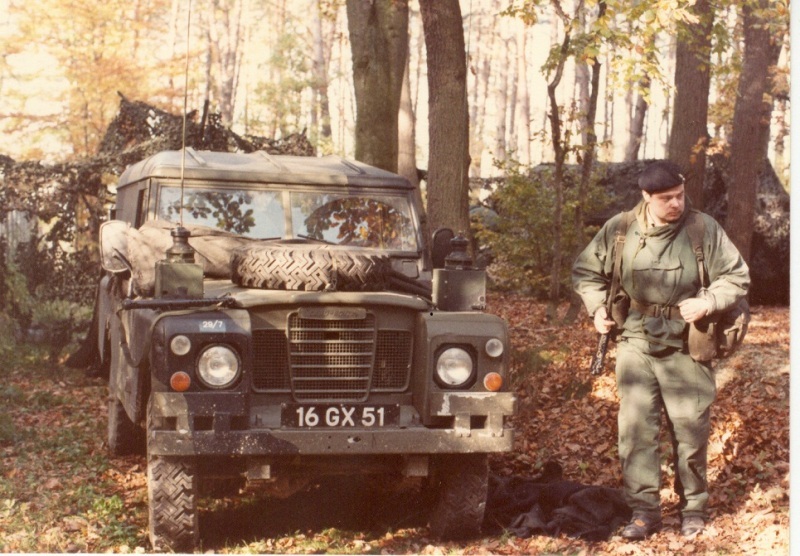 1967 was the first camp with 873 for the webmaster (Peter Cox) and for Steve West. 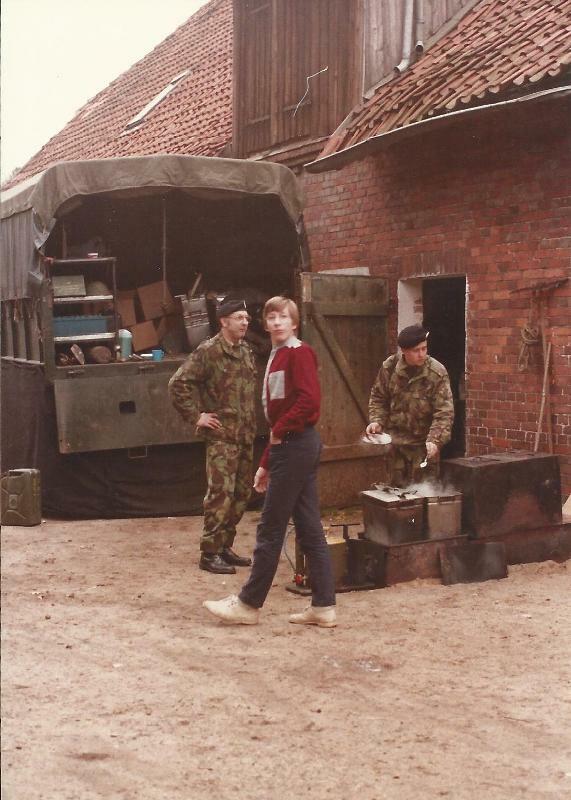 Peter thought it was held at a hutted camp on Thetford PTA(West Tofts or East Wretham); Steve is certain it was at a tented camp at Fingeringhoe (Ranges). 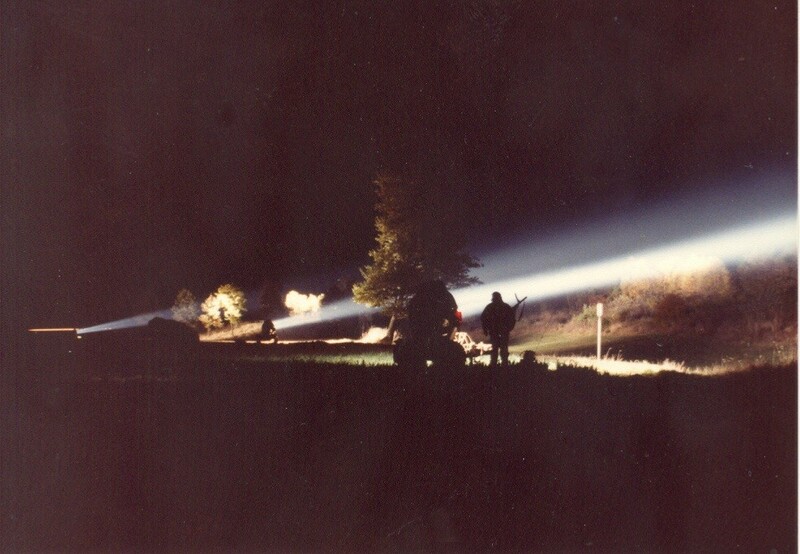 Steve recalls a weekend at Thetford in 1967 doing battlefield illumination. 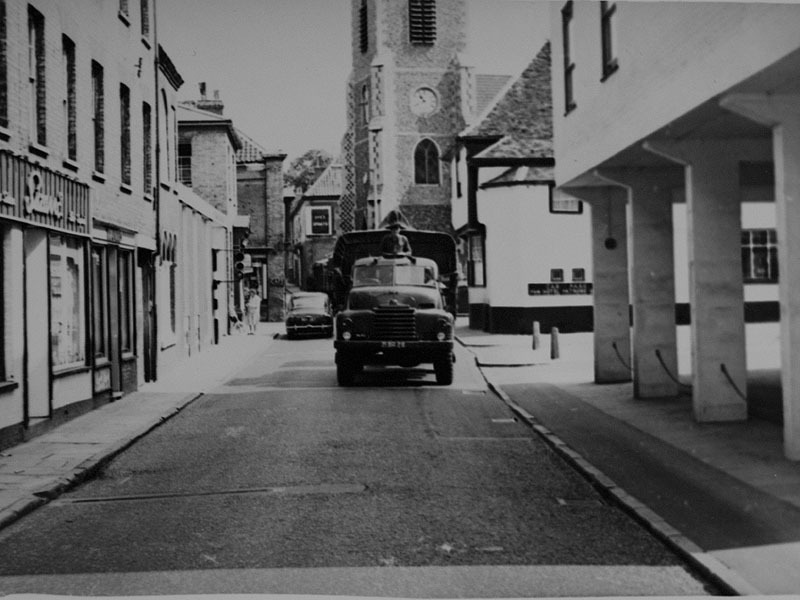 The town centre photo on left has been verified as Thetford as the street-scene is almost identical today. Does anyone else remember where the squadron was based or where these photos were taken? 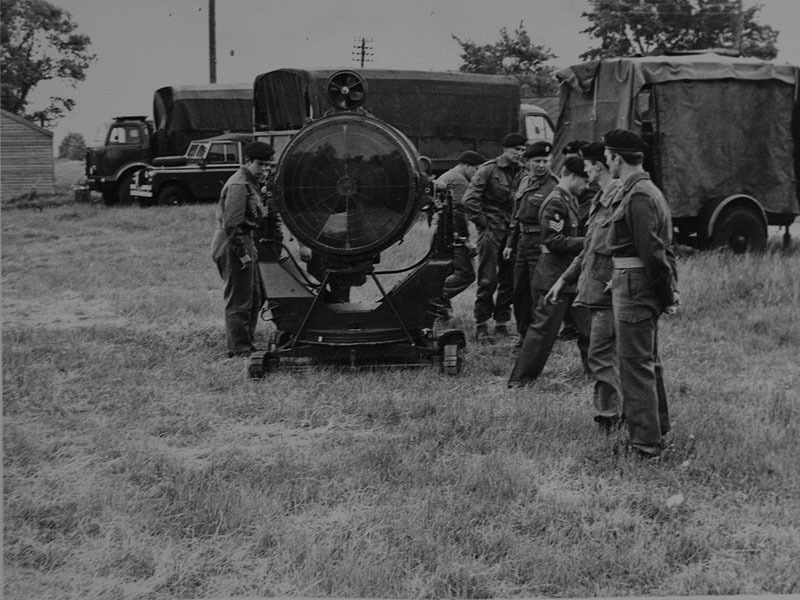 Here the squadron is parked in what appears to be three troops, each with a Land-Rover and two Bedford RLs with mounted 90cms and towing a Lister generator on trailer. The heathland and dense pine forrest landscape is typical of parts of Stanford PTA. 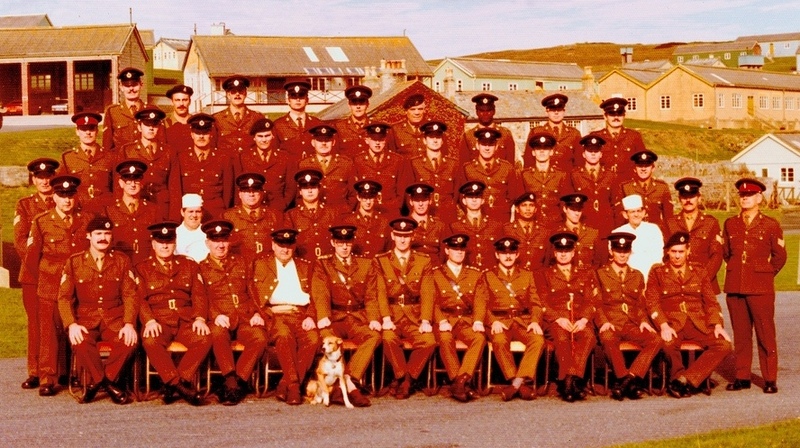 The walking figure appears to be number 44 in squadron photo above. The tattoo is a mystery, don't know whether it was during this camp or not. Possibly used during a driving competition? Note: "TLA" on rad grill. Anyone know what that signifies? but where and for what? from his father Jack's coll'n. Weekend ? 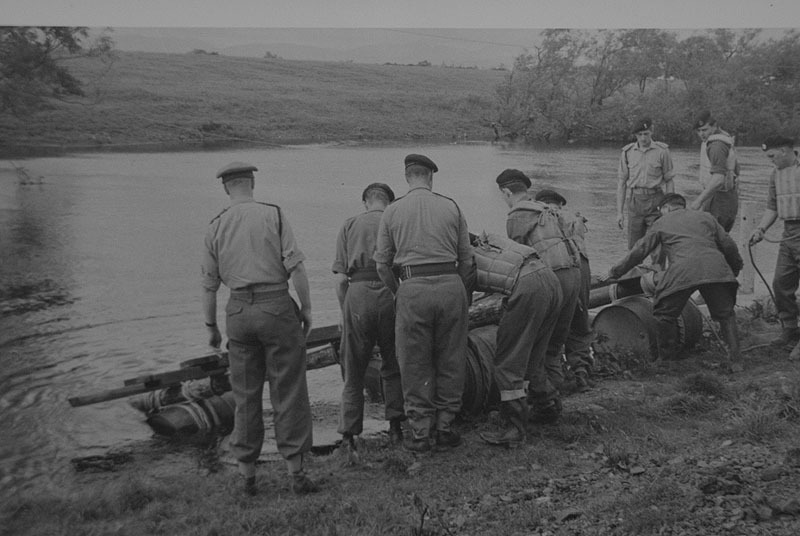 watermanship training, 1967 ? These photos were originally thought to have been taken during 1967 annual camp at Theford, but although they are certainly 1967 or 1968, the location is uncertain. slipway inlet for bridge - as previous. assault boats visible in paddling photo. 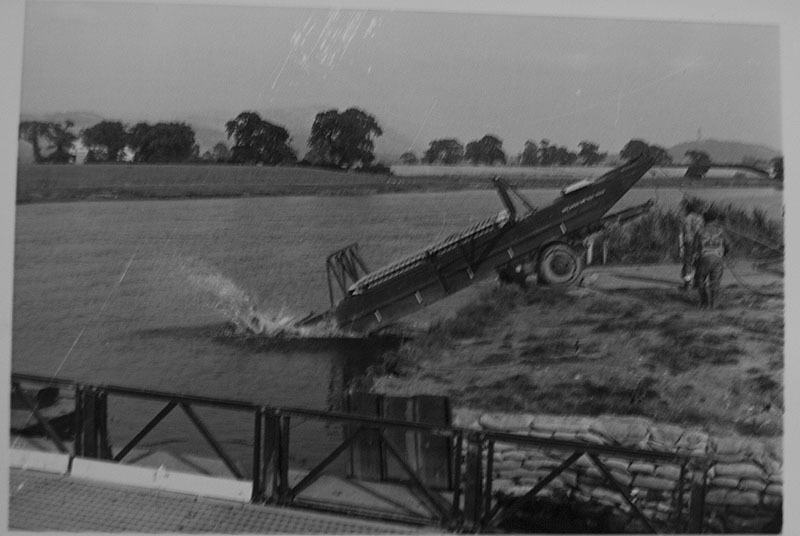 pontoon photo shows a hill in the far distance - could be Wandlebury near Cambridge, which could be seen from Waterbeach. The Cam is frequently used by pleasure craft and rowing boats, so closing that river with a pontoon bridge (LAFB) would not be posible during daylight hours. 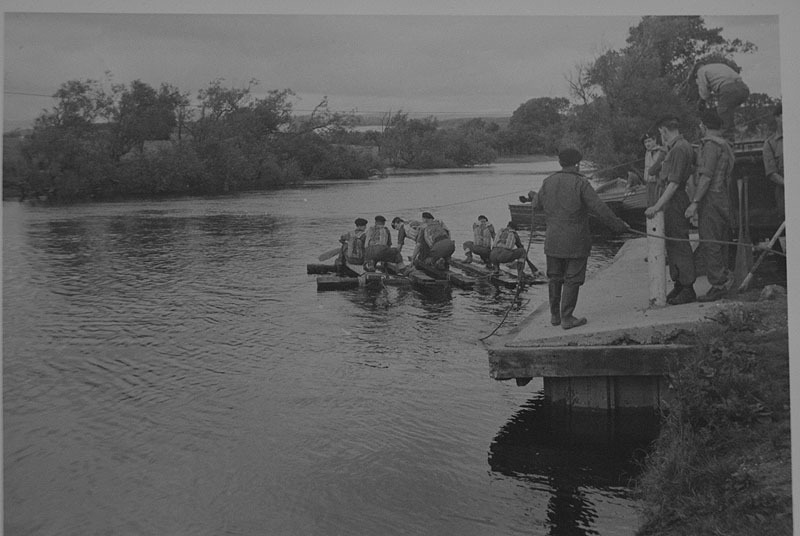 A pontoon raft (LAR) may be OK.
two of the launch party look like Sprs Allen, Byrne & Clarke who were in 873 only in 1967 & 68. The webmaster remembers using assault boats on the Cam, possibly at a weekend, but not when or with which of the three RE units he was in. He remembers that two were joined at the stern to make a long pontoon, and later being on board a single one fitted with a large outboard motor that was taken through locks and into Cambridge, probably contrary to instructions, and creating quite a bow wave. Well, it's difficult to resist the temptation of a powerful motor! back to top of page . 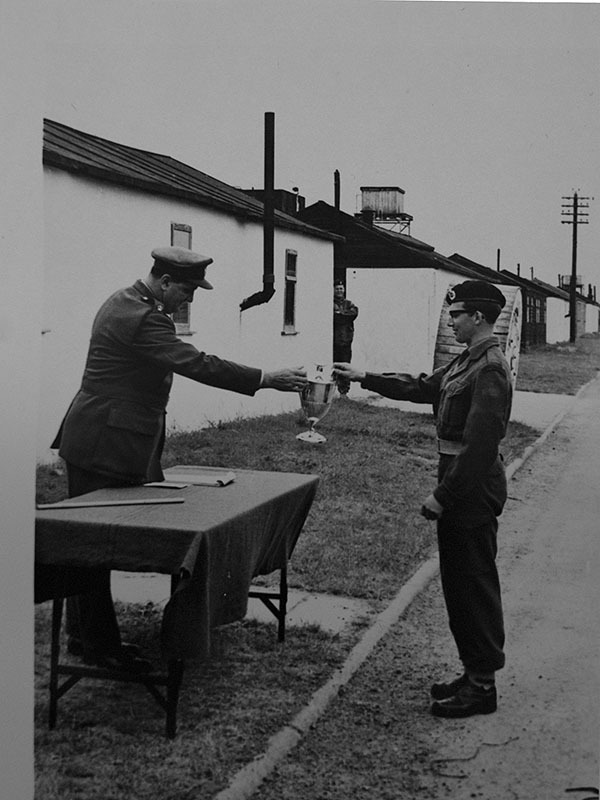 Photo provided by Peter Cox (ex-873, 1967-69); Names provided by Bob Richardson, Ed Woodroffe, Peter Cox & others. Numbers: L-R, Rear 1-15, Middle 16-31; Front 32-47; (Numbers will be added to photo soon, as 1967). 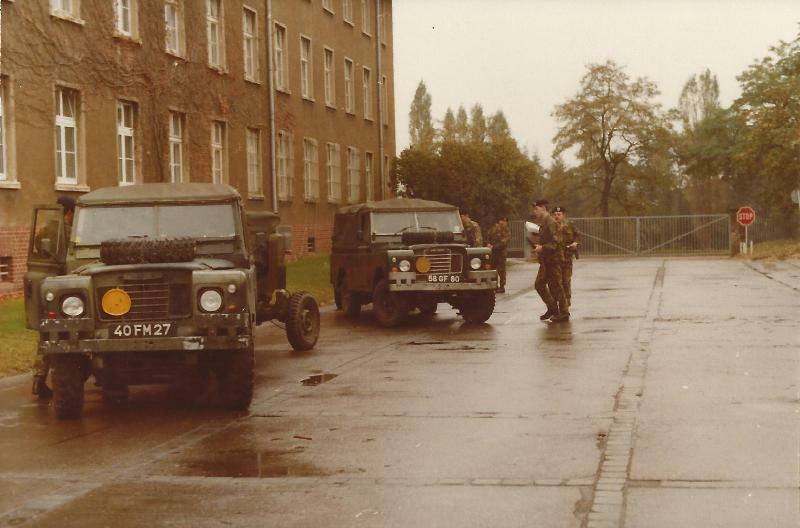 Middle: (16-31) 1st, the REME Sgt; 2nd, Nobby (Maurice) Clarke; 3rd, Mick? Hetherington; 5th, Arthur Hicks; 7th, Stephen Kearney; 8th, Tony Dennis; 12th, Stephen West; 13th, Peter Cox; 14th Mick ? ; extreme right Sgt Jim Hetherington. Rear: (1-15) 1st, Dennis Barr; 2nd, Ted Allen; 3rd Mick Byrne; 6th, "Jan" Janicki; 14th,"Sailor" White; extreme right, Brian ? Photo & some names provided by Peter Cox (ex-873, Apr 1967-69). Many additional names by Bob Richardson (ex-873, 69-70 & 73-75) and Ed Woodroffe (son of Jack Woodroffe). 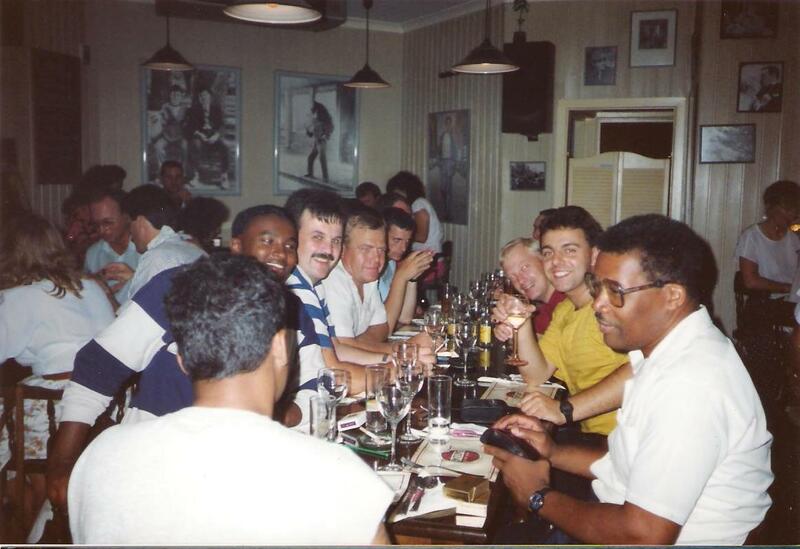 Photo courtesy of Bob Richardson; Names provided by Bob Richardson, Ed Woodroffe, Peter Cox & others. Click photo for better quality and un-numbered version. 50 all ranks: 5 offs, 10 SNCOs (incl PSI), 35 ORs. Odd that many here are wearing Battledress, but in No.2 uniform the previous year. 62 in all. TA: 4 officers, 8 SNCOs, 49 other-ranks incl 3 cooks. 4th row from back:1st, Mick Hewitt; 2nd, 'Pat' Patterson; 3rd, Chief Clerk (in glasses); 9th Brian Hewitt; extreme right, another REME Sgt. 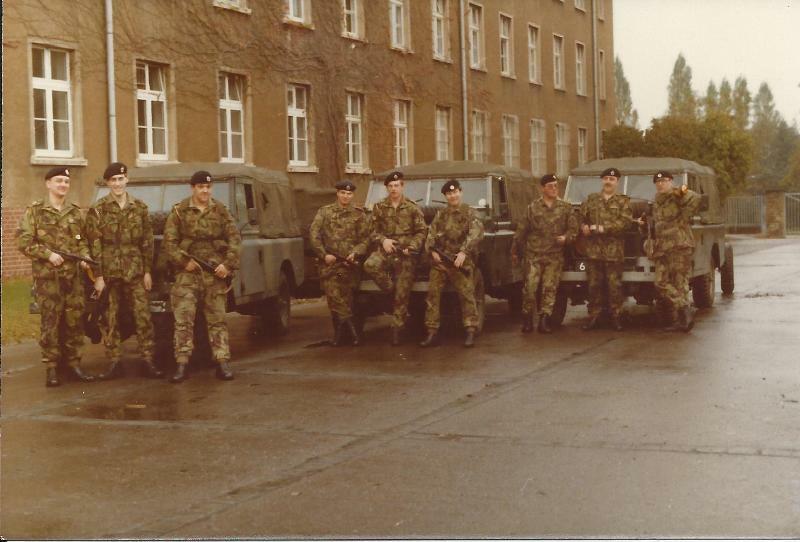 Front:1st, Sgt Tony Dennis (now without beard); 3rd, REME Sgt; 5th, Capt Kennedy; 6th, Capt Cooper; 7th, the OC, Maj Mitchell; 9th, Capt/Lt (?) Robshaw; 10th, WO2 (SSM) Jack Woodroffe. Photo provided by David Samuels (ex-873, 1971-76?). Names by Bob Richardson (ex-873, 1969-70 and 1973-75). Canine details from Ed Woodroffe. Larry Hayward recalls that the Squadron crossed on the ferry, then drove to Osnabrook RE Barracks to get ready [for the exercise]. 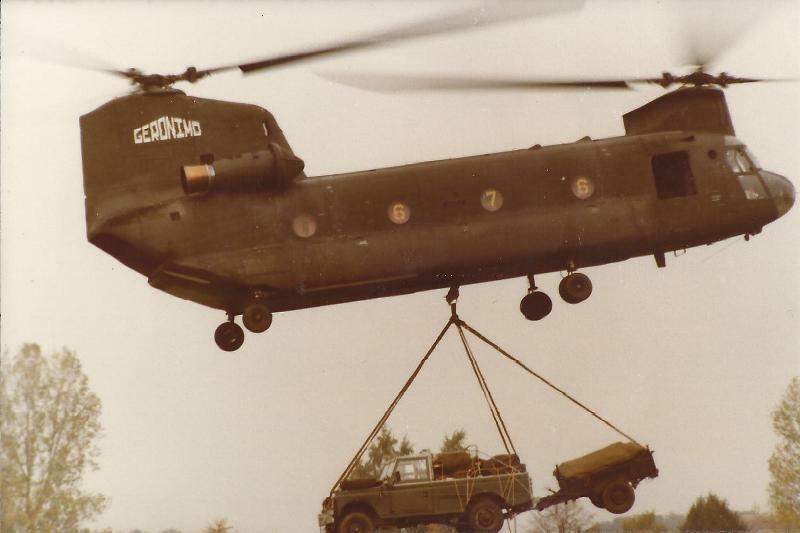 Later, one troop of 873 was flown in to the field during the exercise by US Army Chinooks. 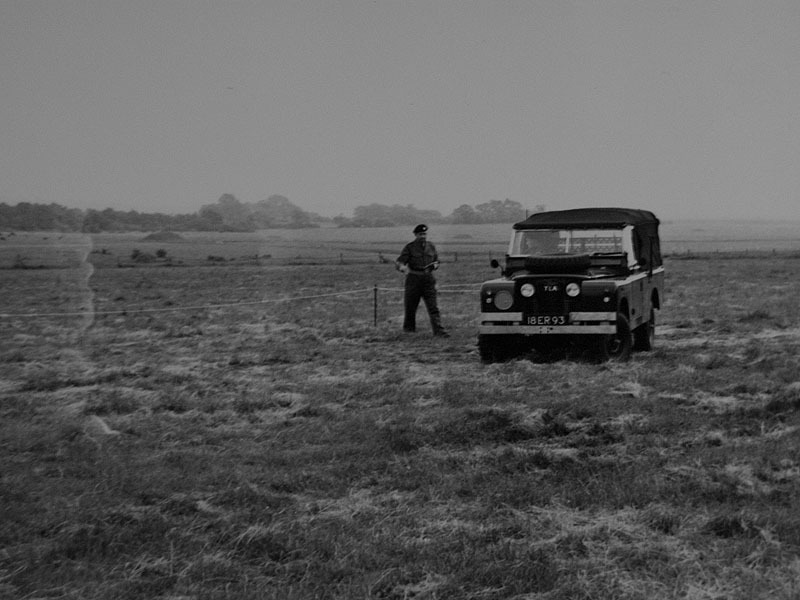 The Land Rover tilt had to be removed and the kit strapped down. The other half of 873 with the two remaining RLs went in by road - sadly for Larry, including him. Finally, the Squadron was deployed in the field. Or rather forrest. Here, Capt. Proud (wearing glasses) is holding an O-group. 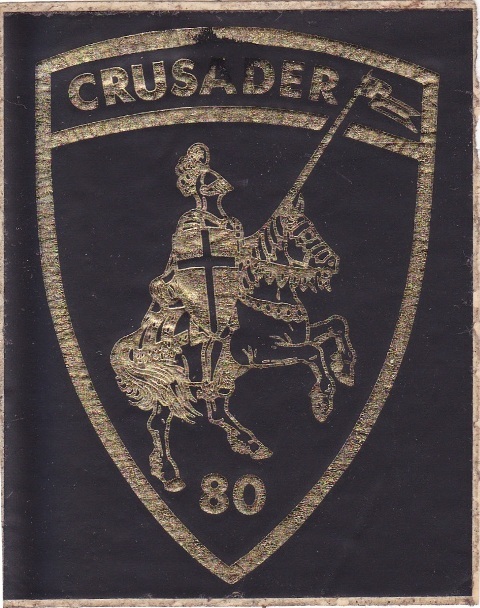 Exercise Crusader 1980 was at the time the largest exercise ever held in NATO. 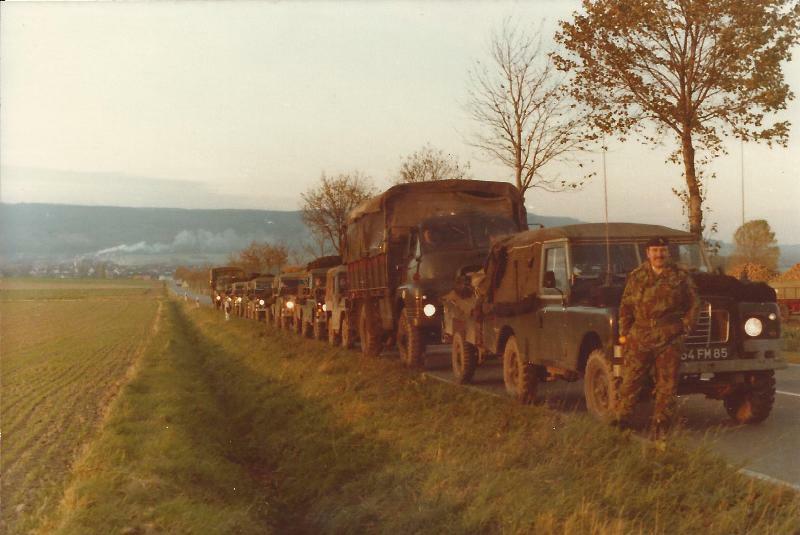 It took two years to plan and lasted a month (but 873 only did two weeks) with a series of minor exercises (Spearpoint, Jog Trot and Reforger) involving UK, US, Belgian, Dutch and German forces. 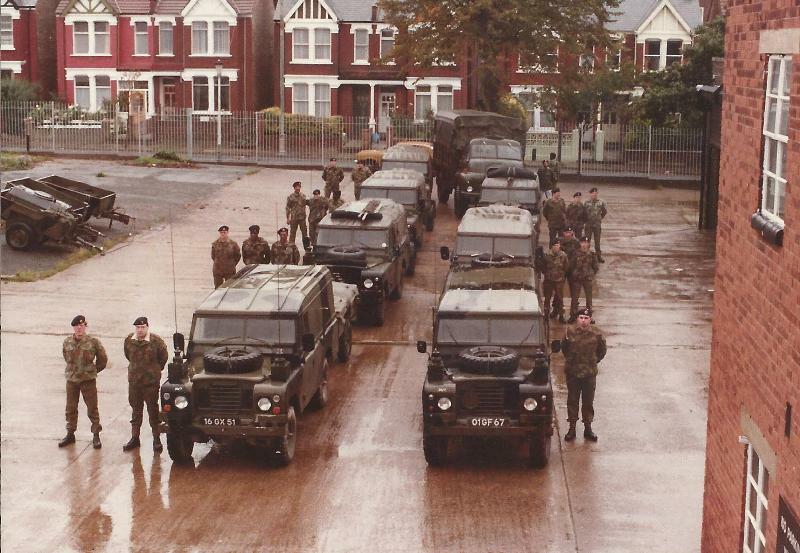 It was designed to test the UK forces capability to mobilise and reinforce BAOR over a compressed period. The main part of the exercise was the deployment of 20,000 Territorial Army and 10,000 regular troops to 1st British Corps. 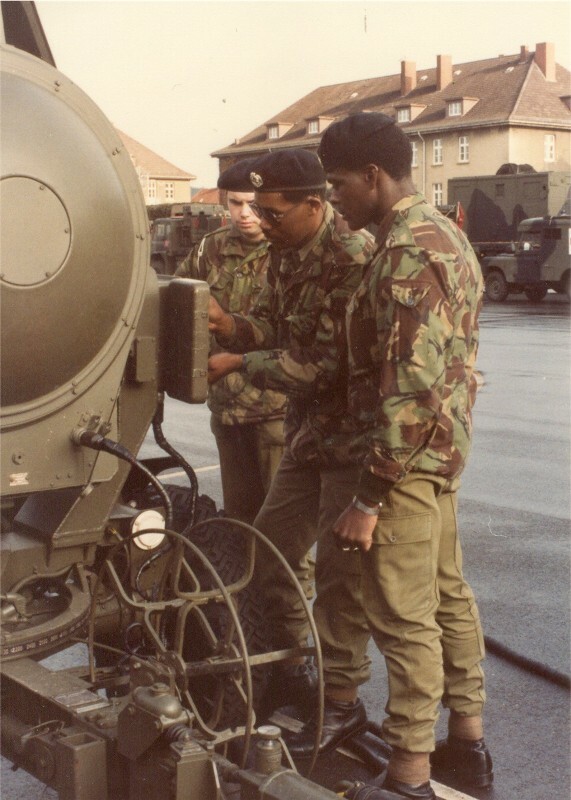 The aim was to have all units in position in Germany within 48 hours of leaving the UK by air or sea using both military and civilian resources. 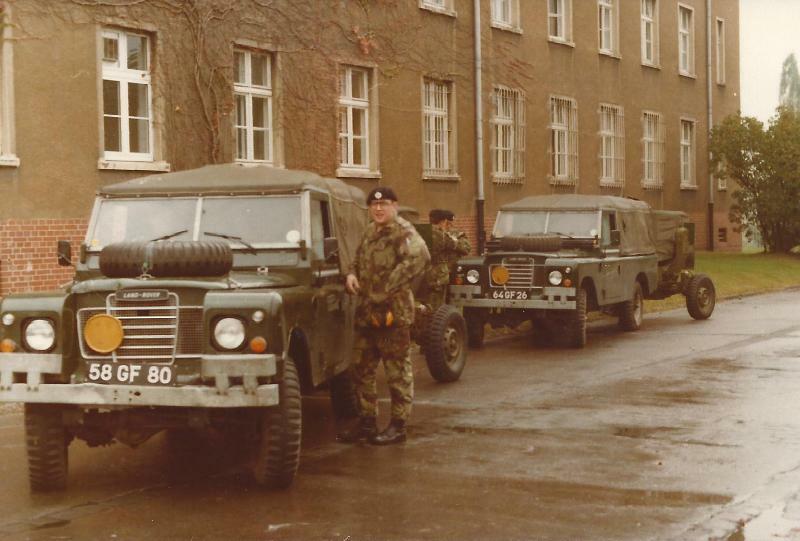 The webmaster was then in 217 Fd Sqn (part of 73 Engr Regt, same as 873) and recalls the Regiment went by air (but without vehicles, and without 873), crammed together sitting on the floor of a Hercules, from Brize Norton to Gutersloh. 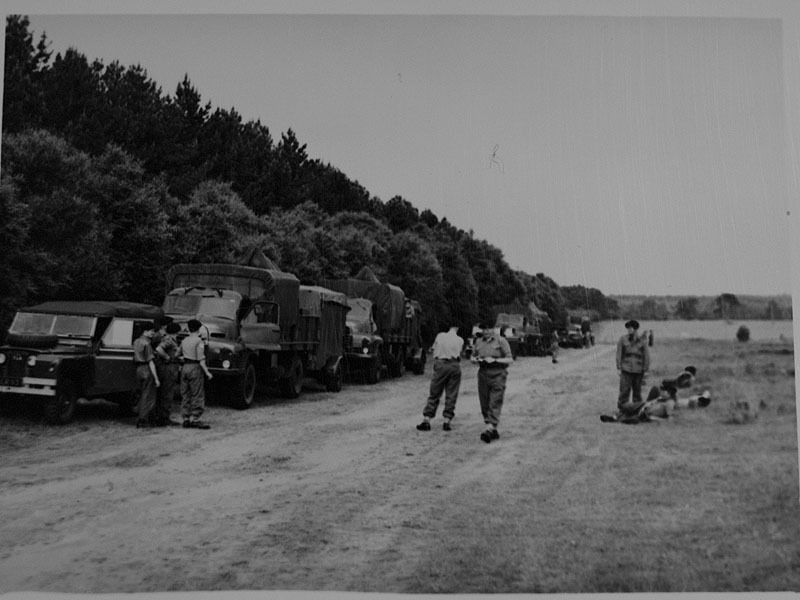 Then by truck to a transport depot where they were issued with a mixture of left and right hand drive trucks, mostly elderly, which had been "mothballed" for years. Some were not in very good condition, and the webmaster remembers vividly the Bedford RL he was given had one rear brake virtually seized up. The steering wheels had to be turned at an angle to make it go straight, and the side-ways motion meant it needed an extra foot or so width of roadway. 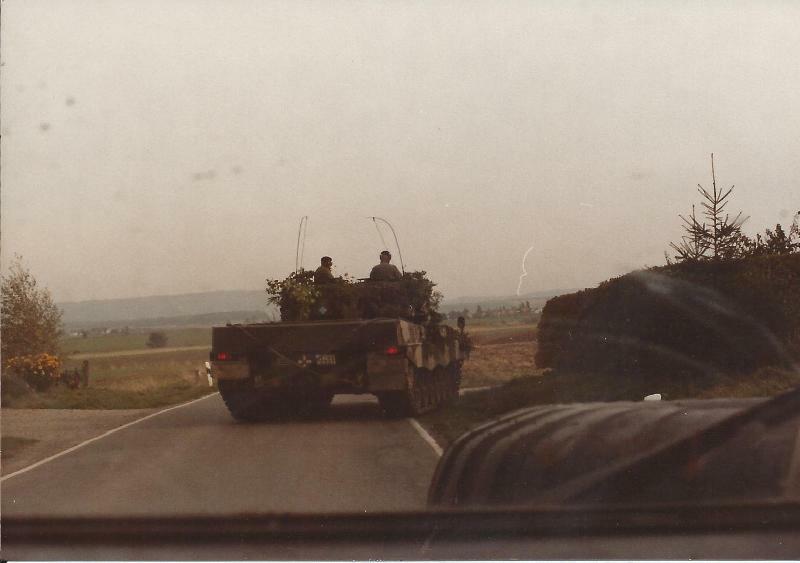 Full revs in third gear was needed to keep up with the convoy, and the driver behind had to suffer the smell of burning rubber. Then off somewhere else, and then another place, for other equipment. 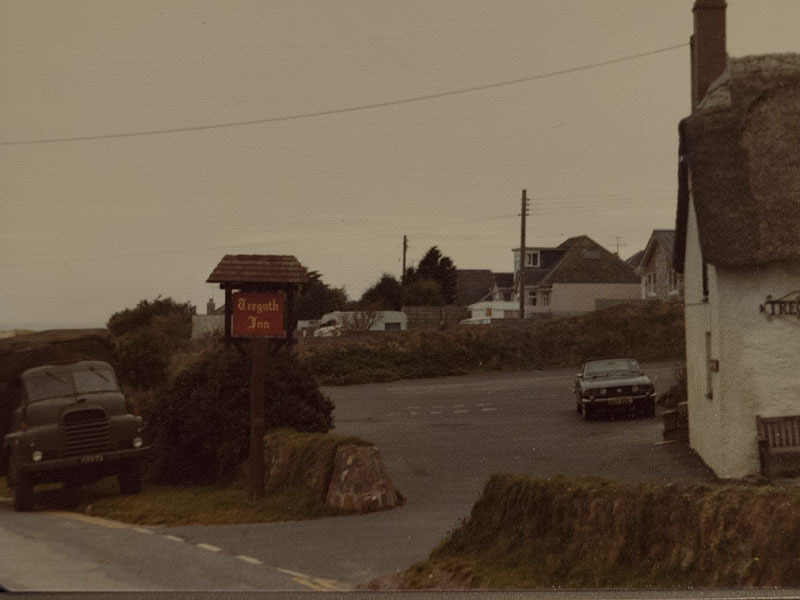 A lasting memory is that 'Chicken & Chips' was served en-route wherever we stopped, and very good it was too. That changed of course when the exercise proper started, during which normal field-cooking fare was served and the drivers were constantly having to change between left and right hand drives, an added difficulty on top of lack of sleep. But back to 873. Larry Hayward remembers a very different journey. The Squadron drove from Acton on the evening of Friday, 12th September, first to Colchester Barracks, then to Harwich Docks, where they sailed with their vehicles aboard a landing ship to Zeebrugge, then drove to Germany, to the RE Tented Camp at Hameln (Hamelin). Much more from Larry on 873's journey, adventures and mis-adventures, to be posted later. 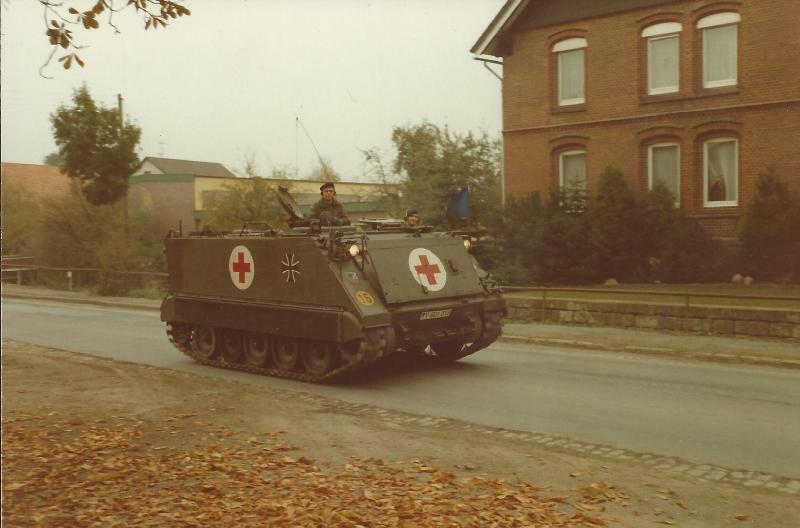 Larry Hayward remembers this started at Hamelin RE Tented Camp (the same as the year before for Operation Crusader 80) before moving out in to the surrounding countryside on the River Wesser. Webmaster: note the "NBC suit", commonly referred to as "noddy-suit", for use in Nuclear, Biological or Chemical warfare, but here worn without rubber overboots and gas mask. 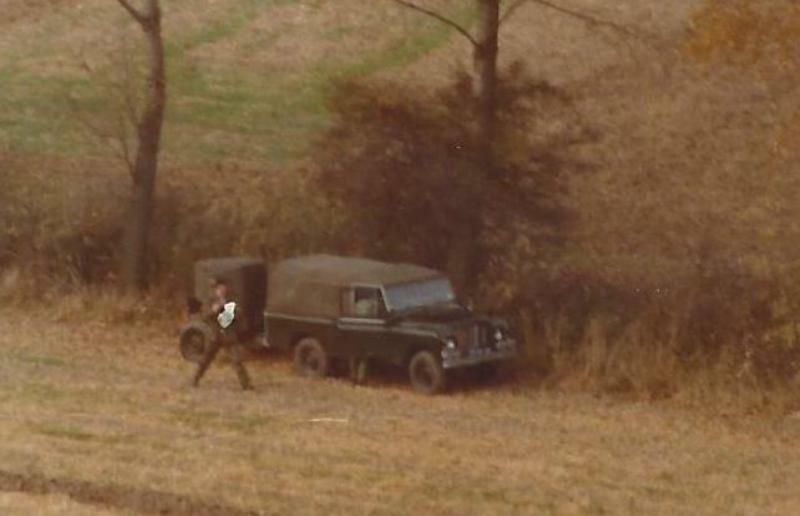 Also "cam-net", camouflage netting behind the Land Rover. 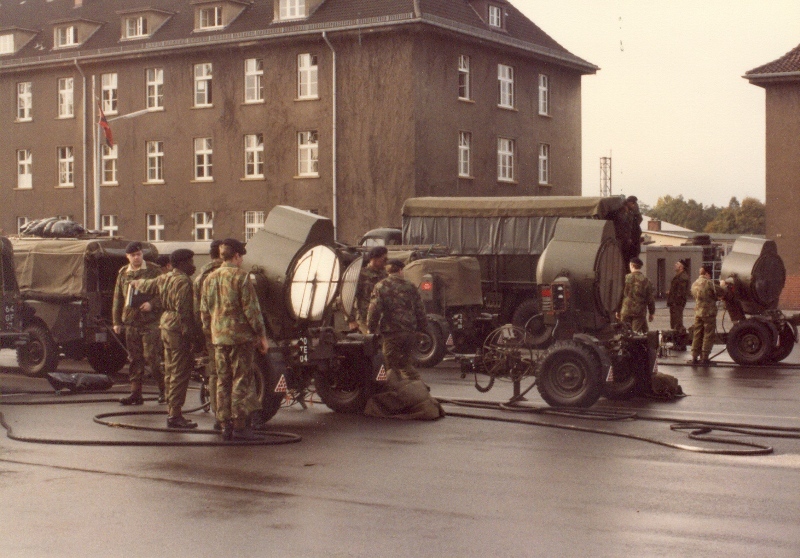 Above, three of the Xenons are being checked and teted at the RE barracks in Hameln, the fourth is still covered in travel mode. 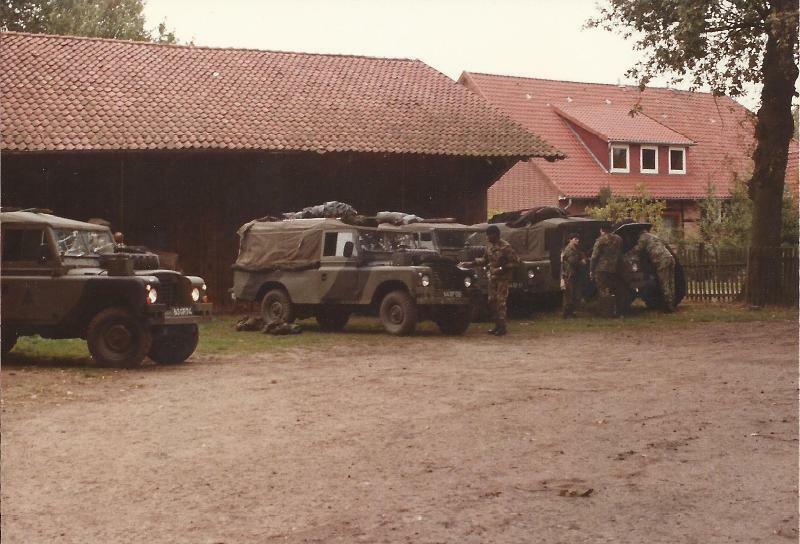 The troop was then deployed, first setting up camp in a farmyard. 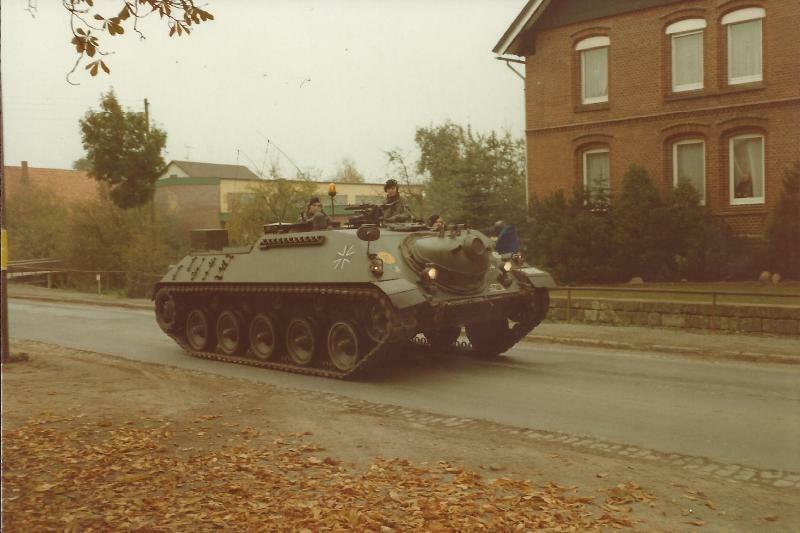 Later, some time was spent with the German 2nd Panzer Brigade near Oldendorf on the River Wesser. 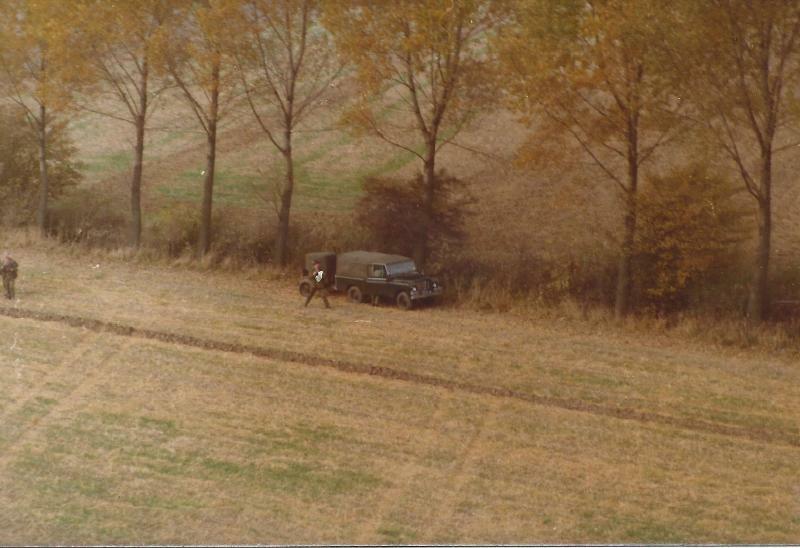 Here is Land-Rover 64 GF 26. 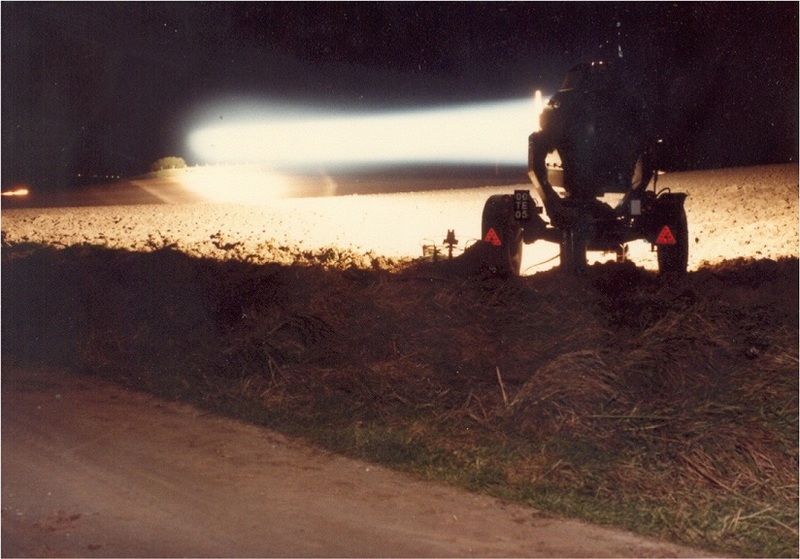 One light was despatched to illumnate an area where a Chieftan tank was bogged in above its tracks and needed to be recovered during the night. 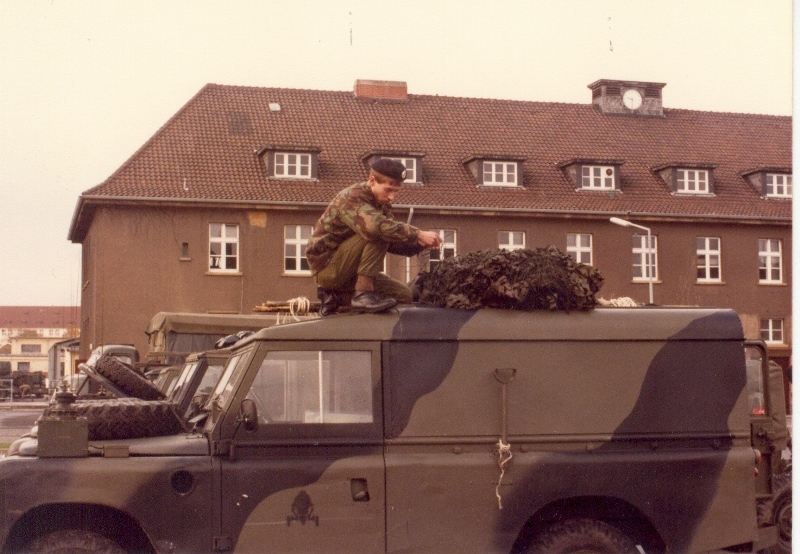 Larry remembers seeing some of the German army lads on National Service wearing berets with long-hair, some with hair nets, which caused some amusement. Tony Storey e-mailed in Feb 2014 with this message and 4 photos. 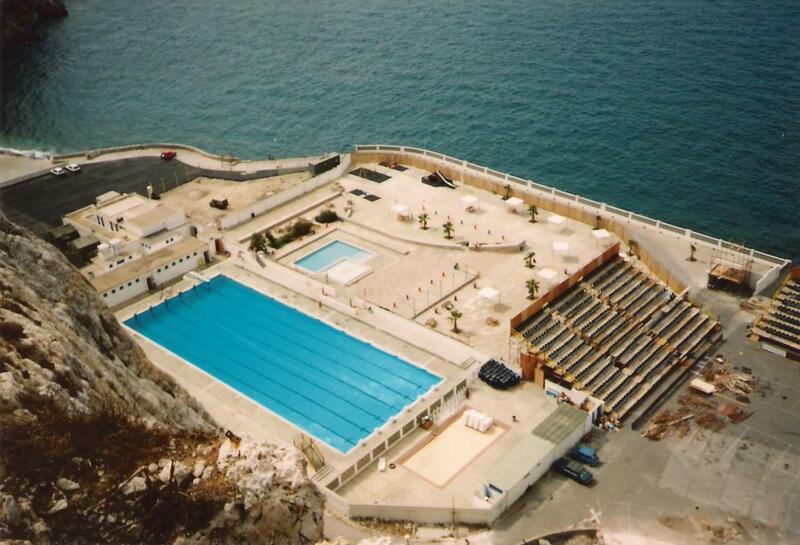 "I wonder if any of the guys remember the deployment/camp to Gibraltar back in 1991? 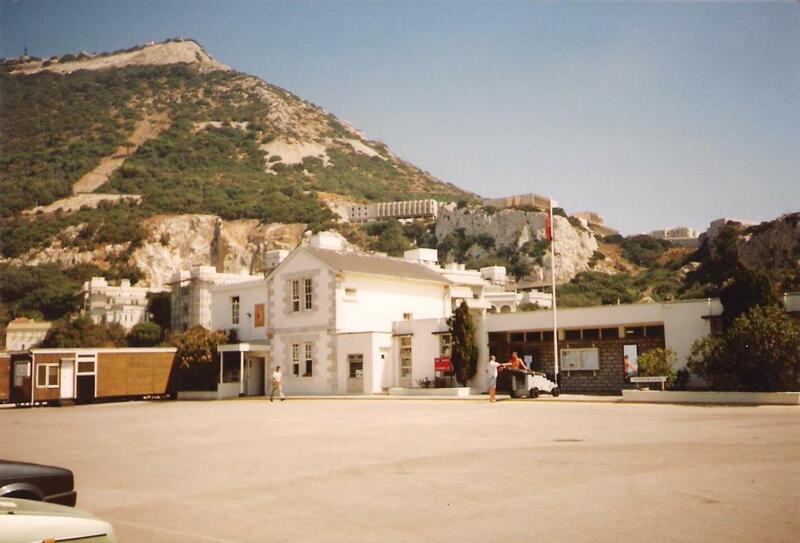 At the time, I was in the REME attached to RHQ and myself (CPL Storey) and Cpl Bob Dalziel joined 873 for a 2 week camp in Gib where the lights were being used to illuminate a military tattoo as the resident battalion (the Green Jackets) were leaving. 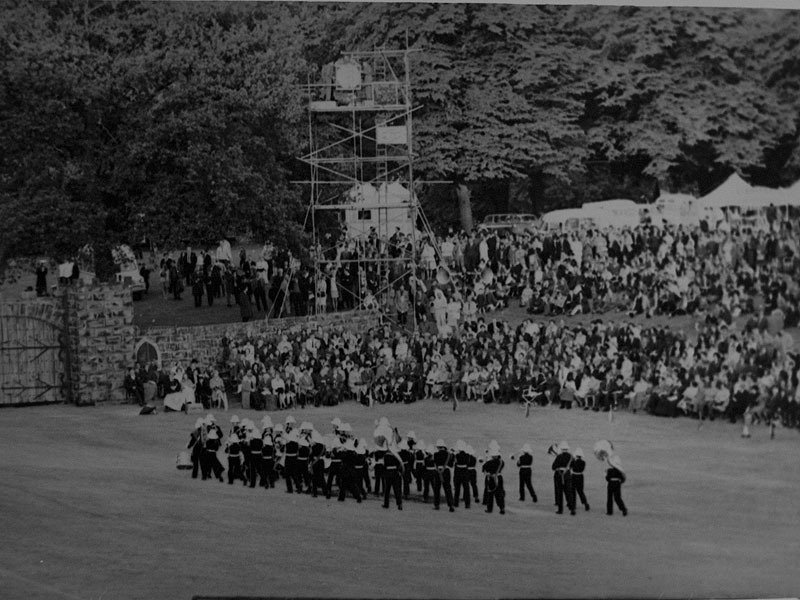 The tattoo featured many acts as well as the Army Motorcycle display team and there were RM Commandos abseiling down the rock. 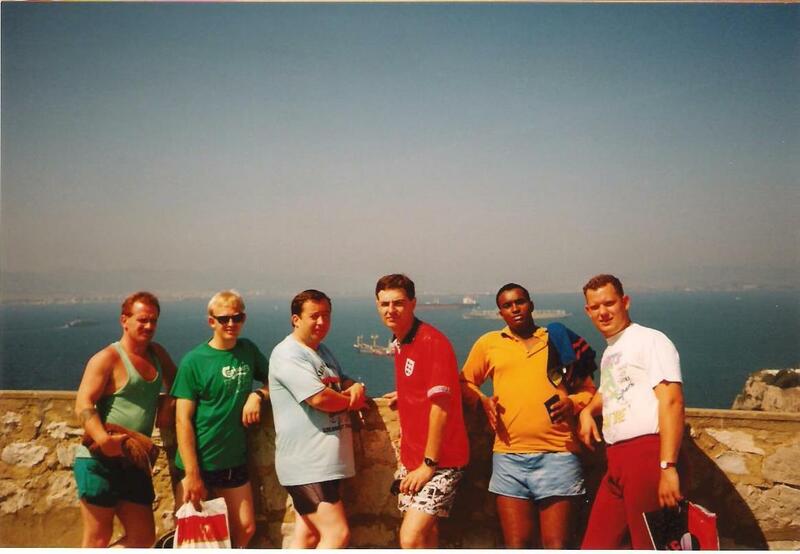 We were stationed at the fortress so could look out over the Mediterranean as HM forces were building up for the 1st Gulf War (as I recall). Attached are a couple of scans of photos that I have. Hope it brings back memories to some." 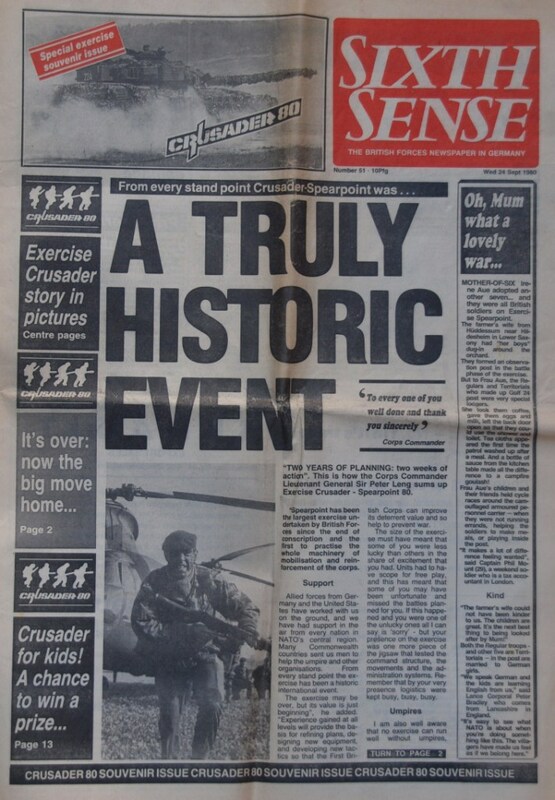 This was 22 years after I left 873, so come on you younger guys, who else remembers this? It certainly sounds better than movement-light exercises with WW2 carbon-arc lights on freezing cold nights on Salisbury Plain that us oldun's "enjoyed". Webmaster's contact details are at bottom right. All sources are acknowledged where known. Copyright remains with the original source.